MOSCOW, January 26. /TASS/. Representatives of Syria’s internal and external opposition have been invited for a meeting with Russian Foreign Minister Sergey Lavrov in Moscow on Friday, the Foreign Ministry’s official spokeswoman Maria Zakharova said. "There will be the representatives of the internal and external opposition," Zakharova told reporters answering a question on the participants. The diplomat stressed that the final list of participants will be known only the day when the meeting takes place. Lavrov said addressing the State Duma on Wednesday that all representatives of Syria’s political opposition have been invited to Moscow on January 27. 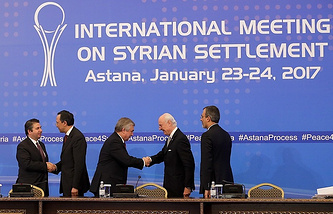 "To make sure that no one suspects Russia, Turkey and Iran of trying to replace everything that has been done hitherto by the Astana process, we have invited all opposition members from among the political opposition (to Moscow) on Friday, those willing to come, and we will brief them on what happened in Astana and the way we see the positive development of the Astana process in the future," he said.